To think of the establishing of Churches of Christ and Christian Churches in the Rogue River Valley is to think of Martin Peterson. The two are synonymous. Mr. Peterson's life was never easy. His first wife, Sarah, died about a year after their marriage, leaving him with one child, Mary. He married Elizabeth Hamrick (or Hanrich) and they had six children, but Mr. Peterson lived to attend the funeral of each except one. 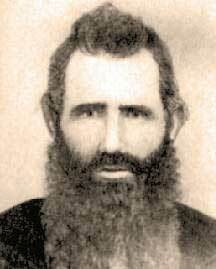 He first crossed the plains with ox teams, bringing his family to Grass Valley, California in 1850. He ministered in the mining areas. Four years later, on account of Elizabeth's health, they returned to Missouri, taking the ocean route via the Panama Isthmus and up the Mississippi River. While in Missouri, Mr. Peterson began preaching regularly and continued this for the rest of his life. In 1863, the family made the overland journey again, this time settling briefly at Galt, California between Sacramento and Stockton. A number of people were baptized and a great time was had by all. One of the highlights of the convention was the arrival of Bro. Martin Peterson who pulled onto the grounds with his "church on wheels." He was a preacher who had just come over the plains and he found that the travelers over the great journey had desired services on the Lord's Day, so he fixed his covered wagon to serve as a church. He was uproarously welcomed into the hearts of the people at the convention. The following year they moved permanently to Central Point, Oregon. On this trip west, he gained the honor of conducting the first "church on wheels." In the wagon train of about 150 people, there were 25 or 30 ardent members of the Christian Church. They held services every Lord's Day including the breaking of the Loaf. Emigrant trains camped near by would invite Mr. Peterson to preach for them. This way, he became widely known and highly respected. Elizabeth remembered those days with great pleasure and said the trip was truly enjoyable. This comment is lacking from most records of emigrant trains. Something of the weekly activities of Martin Peterson can be gleaned from a letter that he wrote for publication in 1871. As the friends of Jesus are ever pleased to hear of the prosperity of Zion, I take this method to give a synopsis of our work in Rogue River Valley, within the past month. On the 14th of May, Brother G. O. Burnett and his son Peter, arrived at my house in time for us to reach our school house to the eleven o'clock appointment, which I had published for them a few days before their arrival. We had the pleasure of hearing Brother Peter in the forenoon, and Father Burnett in the afternoon, speak to very respectable audiences. Father Burnett remained with us until Wednesday evening when he, with Brother Peter's and his own family, left us for your valley. Brother Peter remained and preached for us in this valley, until the 7th inst. During his preaching, there were five (who) made the good confession and two took membership. Brother Burnett immersed one and I immersed one before he left. One of the five was a son of Baptist parents. They advised him to read his Bible, and ask God to give him light, and wait awhile before being immersed, which advice the youth has acted upon until now. O! When will our Baptist brethren learn the way of the Lord more perfectly? Would to God the pious would learn to speak where the Bible speaks, and to be silent where the Bible is silent. Then there would be none to advise the penitent believer to wait for God to forgive his sins or her sins before he or she is immersed. All would say as Ananias said to Saul: "Arise and be immersed and wash away your sins, calling on the name of the Lord." Throughout his diary, he refers to "our school." This is probably the old Mound School, later named Agate School, north of present-day White City. He had built the first building and taught for the first term. For several years he was clerk of the school district. His home was just east of the mound at Camp White where the large white cross was erected for Easter services. On this mound was a lonely pine tree standing on the highest point and the District was called Mound District for many years. Finally it was given the name of Agate District. While it is not certain that Martin Peterson established the Antioch Church north of the present Medford Airport, it is likely because it was close to his home. It had about 14 members in 1871 and met in the Antioch schoolhouse. It is certain that he established a church in Ashland, Oregon. The church had to be restarted in a few years, but a beginning was made. I held a meeting at the Heber Grove school house, three miles east of Jacksonville, last Lord's day, and preached to a large and attentive audience from Acts xxxvi. 24. My discourse was for the benefit of Infidels, of whom there were quite a number in attendance. Besides the infidels, there were other present, among whom was Bro. Ruble and son, of your valley, who are now in Jacksonville on business. . . . Our meetings in this valley are better attended than they have been for some time past. Besides establishing a church in Central Point, he started one in Medford in 1884. He was closely associated with this congregation until his death in 1889. He also established a congregation in Grants Pass. This had to be restarted again in a few years, but it was a beginning! There is a possibility that he also started a church in Jacksonville. Martin Peterson was emphatically a pioneer, a self-made man, and genuine student of the Scriptures. He had a well used library. He was a man of positive convictions and fearless in his exposure of error. It seems we have our afflictions and trials here. But if we are faithful until death, or until our change comes, we will reach a clime where we will be free from these things, and enjoy peace and happiness world without end. The immense crowd of community members that attended his funeral shows the regard he held in the hearts of others. The funeral was conducted by his old-time friend, G. M. Whitney of Eugene. Mr. Whitney had spent his summers near the Peterson farm and was involved with the early days of the Gold Hill congregation. 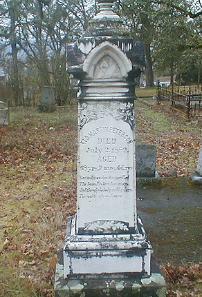 Martin and Elizabeth share a monument marker in Central Point's IOOF Cemetery.